President Moon Jae-in’s administration is running short of time to carry out regulatory reforms that are urgently needed to bolster the sluggish economy, experts say. Over the past year, it has pushed for innovation-driven growth in tandem with income-led growth in the hope of enabling the Korean economy to ride on the wave of new industrial technologies and get a boost from increased consumption spending. But Moon and his economic aides now face mounting criticism that they have done little to put innovation-fueled growth on track while their rash efforts to promote income-led growth have only resulted in worsening low-income earners’ livelihoods. The Moon government has dragged its feet on lifting regulatory restrictions, which is essential to propelling the development of new industries. Experts note more than half of the world’s 100 largest startup businesses would not have been set up in the country due to complicated regulatory rules. 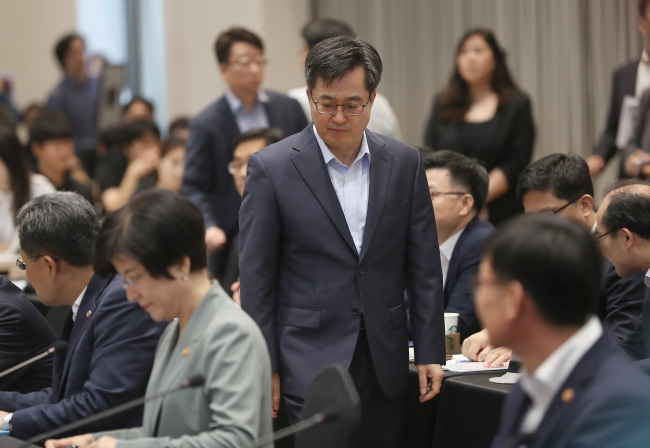 Park Yong-mann, head of the Korea Chamber of Commerce and Industry, complained to government policymakers last month that about 40 requests for deregulation made over the past years mostly remained unanswered. Moon appeared to express his discontent with the lack of progress in deregulation when he abruptly canceled a meeting scheduled to be held last week to review his administration’s work on regulatory overhauling. He earlier said that “it looks like we are walking while our competitors are running” in pressing ahead with regulatory reforms. But calls are growing for Moon to go beyond pushing bureaucrats and take the lead in persuading politicians and interest groups to drop their objections to lifting regulatory restrictions. An official at the Ministry of Strategy and Finance noted key tasks of deregulation, such as fostering shared economies and easing regulations on remote medical care, face enormous resistance from the political circle and interest groups. “Unless the president and the ruling party leadership step forward, there would be little changes to the deadlocked situation,” he said, asking not to be named. A day after Moon canceled the meeting on deregulation, a group of lawmakers from the ruling Democratic Party of Korea visited the KCCI to pledge to pay more heed to demands for regulatory improvements. But the ruling party has made little efforts to pass five bills designed to lift regulations on new industries, which were submitted to the National Assembly in March. Many lawmakers in the party have sided with progressive civic groups in rebuffing regulatory reforms as benefiting only large corporations. Moon may well feel burdened about pushing through deregulation over objections from his political support base. But experts say internal and external conditions faced by the Korean economy are too severe for him to discard efforts toward deregulation. Recent data from Statistics Korea showed retail sales and facility investment fell 1 percent and 3.2 percent on-month in May, respectively, marking the second and third monthly decrease in a row. The on-year increase in the number of newly employed people remained at 72,000 last month, the lowest since January 2010. According to figures released Sunday by the Ministry of Trade, Industry and Energy, the country’s exports dropped 0.9 percent from a year earlier in June, marking the second monthly fall this year following a 1.5 percent decline in April. Escalating trade tensions between the US and its major trading partners and possible financial disruptions in emerging economies are set to continue to weigh on Korea’s outbound shipments. Most private research institutes here remain skeptical about the possibility the economy will achieve the government-set growth target of 3 percent for this year. 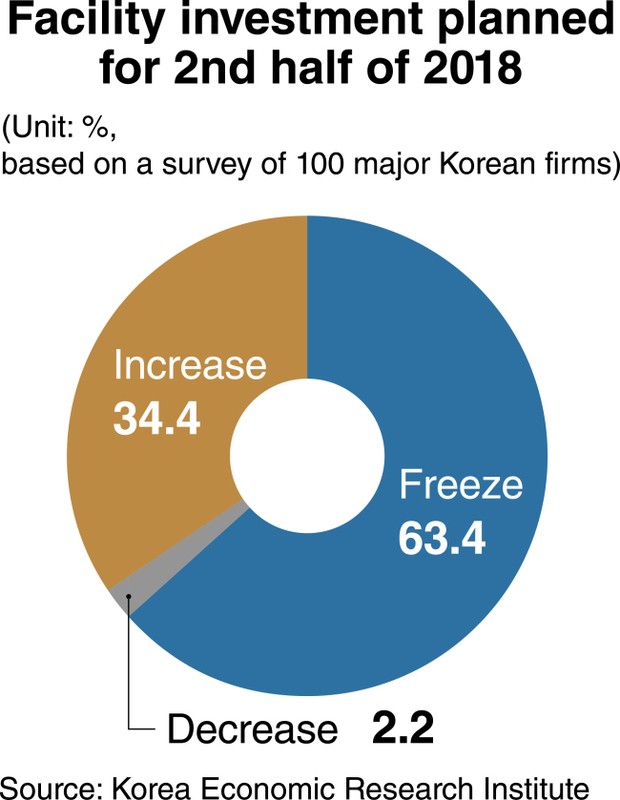 In a recent survey of 100 major local firms, conducted by the Korea Economic Research Institute, nearly 90 percent said the Korean economy has already entered a phase of slowdown. More than 65 percent plan to freeze or reduce investment in the second half of this year, with over 74 percent expressing dissatisfaction with domestic investment conditions. “What is urgently needed now is to forge the business-friendly regulatory environment to help reinvigorate corporate activity,” said Sung Tae-yoon, a professor of economics at Yonsei University. Experts note incentives offered to encourage corporate investment and employment should be discerned from unfair benefits. A steep rise in overseas investments by local manufacturing firms also raises the need to accelerate deregulation and other efforts to improve business conditions at home. According to a research institute affiliated with the Export-Import Bank of Korea, offshore investments by the country’s manufacturers soared 68 percent from a year earlier to $11.4 billion on the basis of declaration during the nine months from July last year. The steep increase contrasts with a 2.3 percent decrease and a 5.4 percent increase recorded in the first three quarters after Moon’s two immediate predecessors took office. Critics note the Moon administration’s push for deregulation is set to be hampered as innovation-driven growth aimed at boosting corporate activity contradicts income-led growth propelled by a raft of labor-friendly measures. The recent reshuffle of senior presidential aides on economic affairs and job creation has prompted speculation that Moon might seek to readjust the mixture of such incompatible tracks, though the business community remains skeptical about the possibility of a major shift in policy. “Income-led growth cannot be a way to revive the Korean economy amid worsening corporate conditions,” said Sung, stressing the need to shift the economic policy in the direction of strengthening the international competitiveness of local firms.